Is there a bug in GS? Common behaviors not working! — Welcome to the GameSalad forum! Is there a bug in GS? Common behaviors not working! I have an game that I created and submitted to App Store. It was rejected because it did not have a parental gate. I created a copy of my game file so I can add a parental gate. I added another scene with a challenge question and an boolean attribute to confirm Partenal Gate question was answered correctly. I am using @Armelline In App Purchase template and added the parental gate attribute as a condition for the purchase to be made. Everything looks right as far as I can see, but basic behaviors are not working correctly. The Red Actor in the Parental Gate Scene is not changing the scene to the locked menu even though it is the exact same actor as the one over the yellow that is going to the locked menu. The Unlock Button on the Buy Scene does not change scene to Parental Gate. I don't know what I happened. All these behaviors worked in the first version, but in this copied version anything that I add or change does not work correctly. I even uninstalled and reinstalled game salad just incase I got some kind of virus or something. When I click on the play button on the initial scene or the red button of the parent gate scene, the project hangs and I can't continue. I am not having any issues when I run the preview on the initial scene. I don’t see anything wrong in the rules and behaviors. I don’t know why there are issues in this file and not in any of the other files I have had. Could It be a virus or something? I wouldn't expect a virus to be causing this, no. The rules for changing scenes look fine to me. It's more complicated to troubleshoot why a scene is hanging/freezing. It could be caused by many things. I'll let you know if I find anything obvious. Debugging this requires a bunch of Log Debugger statements. Thank you soooo much for your help. This is my first app and I was almost finished. So it’s a little frustrating to not know what’s wrong this close to finishing. There will be an incorrect table reference somewhere. I'll dig it out. I was wrong - you have a button called "Nope" under the Buy button that changes scene to the current scene you're on. So when you're pressing it's changing to the same scene you're on. Remove that and it'll take you to the parental gate scene without issue. These Nope actors are also present on the parental gate scene. Remove all those Nope actors and see if things work better. 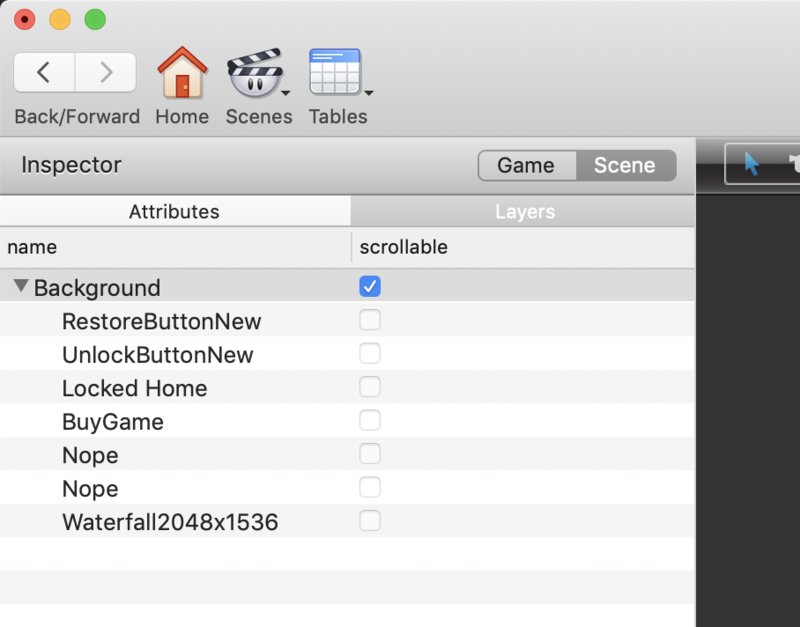 I'm not sure why this is but when I delete the background image actor (Waterfall2048x1536) from the Parental Gate scene, that scene runs SO much faster and the red button takes me to the Buy scene. Keep in mind that actors in the scene layers such as the Nope actors will still function in the background so that may be causing some of the issues you're describing. Typically, you would use a Pause Game behavior rather than a Change Scene behavior when overlaying actors like that. How can I see all the actors that are opaque in a scene? I thought I got everything. Thank you. Now it looks like the only issue is the unlock button is not going to the parental gate scene. Should I try it as a Pause game behavior instead of a change scene behavior? Also @Armelline is adding the Parent Gate attribute true the best way to run the in app purchase with the parent gate? I figured it out!! Thank you so much!!! @Sheba's Jewels Glad you got it sorted out! I use a game attribute in a similar way when adding a parental gate. Your solution could be done a bit more efficiently using Pause Game rather than Change Scene, but it's a solid approach to use. I'd also recommend you remove the game project file from your first post now if the problem is fixed! Agree. There's a history of not so-ethical folks stealing games and re-selling them. It doesn't happen often but it's a possibility.